Here is a review of the Lanparte LA3D-VR-01, a new gimbal for 360 cameras with an unusual design. 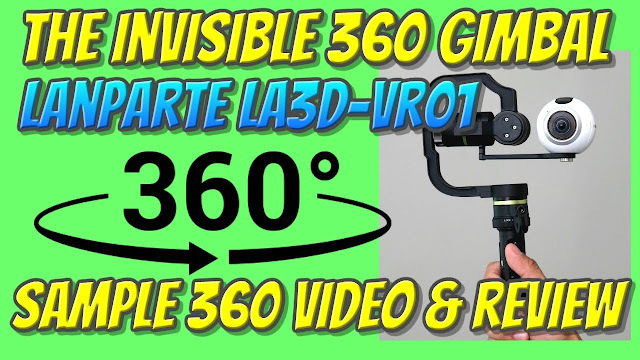 There are now a handful 360 gimbals for consumer 360 cameras on the market, and the Lanparte LA3D-VR-01 (aka LA3D-VR01) is the newest one. It has a distinctive design that places all three motors (pitch, roll, and yaw) within the stitch line of your 360 camera, thus making the gimbal invisible as long as the gimbal is vertical. I received a review copy of the LA3D-VR-01 from Lanparte, with no strings attached. They just wanted an honest review. The package I got was brand new but I didn’t find any instructions. Nonetheless, it was easy to figure out. 1. Attach the handle to the gimbal. You need to align white dots on the gimbal and the handle, then twist a ring on the handle to lock the two together. 2. Attach your 360 camera. To attach a 360 camera, you simply screw the camera onto the 1/4-20 bolt on the gimbal. The bolt can be moved around 2 cm laterally. There are no counterweights, so there’s no need to balance your 360 camera. 3. Turn on the gimbal by holding down the power button. This will put it on standby. Hold down the Mode button to power up the gimbal. – By default, the gimbal is on 1-axis lock mode (only the roll is stabilized). Pitch and yaw will be dampened. You can also switch to this mode by tapping the mode button once. An LED above the mode button will be green to show you are in 1-axis mode. This mode is nearly useless for 360 cameras. – Tap the mode button twice to switch to 2-axis lock mode (pitch and roll is stabilized). Yaw will be dampened. In this mode, the LED above the mode button is red. – Tap the mode button three times to switch to all-lock mode (pitch, roll, and yaw stabilized). In this mode, the LED is blue. 5. The handle has a joystick to control pitch and roll (in 2-axis mode) or pitch and yaw (in 3-axis mode). 6. You can tap the power button to make the camera turn 180 degrees (to face forward or face backward). – 2016 Samsung Gear 360 – works perfectly. Motor arm is invisible. – Nikon Keymission 360 – works perfectly. Motor is very slightly visible. Need to remove the silicone protector on the Keymission. – 2017 Gear 360 – works but the motor is visible and warps every second or so. The warping is a 2017 Gear 360 issue. – Garmin Virb 360 – works. Motor arm is slightly visible. Note: Virb 360 has its own built-in gyro stabilization. – Kodak SP360 4K Dual Pro – too heavy, even with a bracket to lower the center of gravity. Anyway, here’s a video showing how well the stabilization works, and how the gimbal looks from the camera’s view. So here are the strengths and weaknesses I’ve found so far. + Unique design places the motors within the stitch line for thicker 360 camera (e.g. 2016 Gear 360 or Nikon Keymission 360). + Lighter than other gimbals because there’s no counterweight, making it less strenuous to use for long periods. + Modular design works with other LA3D gimbal accessories such as the wireless control kit. + Can be used with handle in horizontal position. – Cannot support heavier 360 cameras such as the Kodak Pixpro 4K dual pro. – If used with slim 360 cameras, the motor will show up in the shot. – Yaw is limited to around 405 degrees. If you do hit the yaw limit, and you continue to press, the gimbal will turn the motor off. For this reason, I prefer to use it in 2-axis lock mode (rather than all lock mode). With this mode, the camera will face you all the time and there’s a much lower risk of hitting either yaw rotation limit. – Cannot be used inverted. – Does not appear to have a quick reset orientation mode. Instead of a 1-axis lock mode, I wish tapping the mode button once can be used to reset the orientation. – The screw for the camera has a slot for a coin or screwdriver but no keyring to make it easier to use without tools. – It’s very easy to accidentally nudge the joystick and move the pitch. I hope the pitch control can be disabled. Landparte LA3D-VR01 is currently on sale at Amazon for $199 (versus the normal price of $279) but last time I checked there were only 2 left in stock. Thank you for using these links to support 360 Rumors at no additional cost to you so I can do more tests and reviews! I would also really appreciate it if you could take a moment to hit the like button on the YouTube videos, which will help make the videos visible to other people. Underwater housing for Samsung Gear 360 (2016) now available!